Walnuts are a known natural food for excellent function or our brain, and main benefits of walnuts are focused on this property. For example, according to a recent study carried out by a group of American scientists, daily consumption of walnuts is linked to improved memory in women. This property takes source from a high content of fatty acids, polyphenols and other antioxidants in walnuts, which assists in stimulating brain activity and improving its function. At that, the specialists are convinced that eating walnuts on a regular basis can also lead to improved mental abilities and coordination. However, in addition to these important benefits, a group of scientists at the University of Harvard studied the effects of walnuts on people with various cardio-vascular problems. It turned out that walnuts can lower the risks of having a stroke or a heart disease, as well as protect against other possible diseases of cardio-vascular nature. These properties are also attributed to a high content of antioxidants, vitamin E and fatty acids. Finally, the experts point on a great potential of walnuts or walnut products to be a new generation remedy to lower the levels of bad cholesterol in our blood. The main problem that the specialists point on is: in order to enjoy all the benefits of walnuts, a person should consume 7-9 walnuts a day. This dose is quite high in calories (is equal to two table spoons of vegetable oil) and is simply not recommended to many of us. 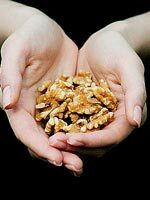 In other words, consuming such amounts of walnuts on a regular basis can be dangerous for many people. That is why the scientists are now working on creating an effective walnut supplement or other natural product containing walnut extract, which would be not harmful to the most of people and give us an opportunity to enjoy the benefits of walnuts for our good health and longevity. This entry was posted 9 years, 3 months ago. It’s good that you’ve mentioned about Walnut and its benefits. I do support too the natural way of getting fit and healthy. Keep up the good job here.